Once again I'm highlighting a fabulous pair of shoes that are available at H&M. With the green sorbet colors - mint and pistachio being so popular for Spring, I had to showcase these uber-feminine H&M Slingback Shoes. 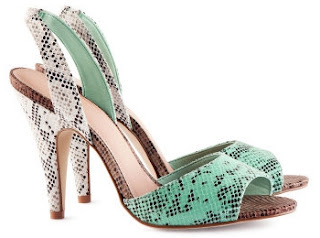 These faux snakeskin leather slingbacks feature a 4 1/4", triple hue snakeskin print, and open toe silhouette. Pair them with mint or cream colored jeans for a fresh and cool spring look or a chic dress for ease from day to night. And because these are H&M, they're only $29.95 so get them quickly.